We’ve planted hundreds of hardwood seedlings to replace trees felled for lumber and firewood. This allows us to regularly improve the health of the forest. Enjoy our 90 second video of the process. 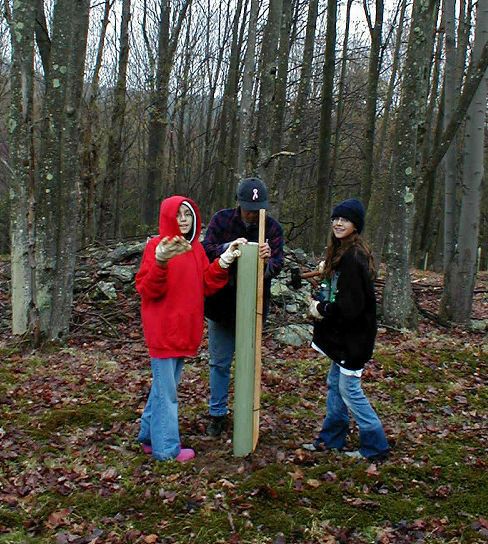 Our replanting program adds a mixture of hardwoods including white oak, sugar maple, black walnut, and cherry trees. Tree shelters are used to protect the seedlings from animal browsing (especially deer) and wind, while providing a greenhouse environment to promote growth.